Paying Ready Attention: What's real? It would be fair to say that when I first saw a platypus I got rather excited. Spy satellite images would probably show me hoping from foot to foot and pointing. It’s not that I was getting great views, far from it in fact. It was just that I was seeing platypus. In the wild. In the flesh. I’d quickly learned to drop the “duck billed” part of the name in favour of the shorter and more accurate version. After all, there is no “eagle billed platypus” or whatever, so the duck billed bit can be shed without confusion. There’s just the platypus. And there they were, floating like slightly plump sticks on the surface of the water. With a humpbacked dive they would disappear, until they bobbed, flat backed, to the surface and into view again. I don’t doubt that the return of these living corks to the surface of the water was greeted with laughter and more pointing. And a good part of that laughter, that wonderfully positive feeling, was not due to the fact that I was watching one of the most truly remarkable animals in the world, but due to the fact I had found these creatures by dint of my own research. A mention in the paper here, a similar story on a web page, and I worked out where to go. Now, I’m not claiming this is some sort of historic discovery, but I was looking at an animal I had always wanted to see, and I had found it under my own steam. Since that time I have had better views of this mix and match mammal, and I never tire of seeing them, but something remains special about this first sighting. I have found them completely by accident in a high tarn at Mount Field, watched them swim in rivers from a beer garden behind a small pub and found them, distant and shy, in large lakes. But if ever a sighting was real and all mine it was probably that first one. The most recent time I saw a platypus, things were very different. 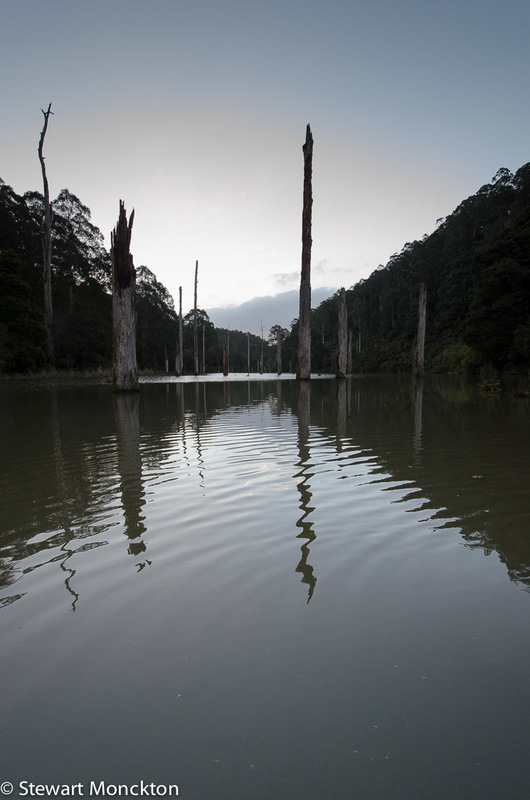 I had paid to go on a trip on the very same lake where I saw the first ones – Lake Elizabeth. And as soon as money changes hands I think the nature of what you are doing, what you are expecting to happen, changes. We met outside a country café in Forrest, a place that brewed decent coffee and its own beer – a winning combination if ever there was one. It was not really the afternoon, but neither was it evening. It was that time of day that can sprint past if you are enjoying yourself or linger on if you are waiting for something to happen. Our guide, as seems typical of such people, was soft spoken and unconcerned with fashion. I noticed he was wearing rubber boots and wondered at my own footwear. As we dropped down a steep hill the gum trees on either side of the road began to hold hands above our heads, and the light fell rapidly. Lemon yellow life jackets, sage advice about wearing them and a couple of short handled paddles were handed out. Water that yesterday had rattled against our windows now flashed down the river in the valley bottom. It was calf deep over the concrete walkway that cut the river and gave access to the other bank. Now the rubber boots made perfect sense. Prior warning would have made sense as well. I waded (what a legend!). Our guide did too, shuttling the boots from person to person. H and P struggled with socks and damp feet, balancing on one leg, hopping to keep balance and laughing at the other’s stumbles and arm waves. The water was crisply cold and clear, the woods smelled as only Australian woods can and parrots, high above, called. Did they speak of blossom lost and found, the passage of a hunting hawk, the silver drip of cool water under a shade dark bank? Who knows? It was all rather Lord of the Rings – but without the foaming white horses. 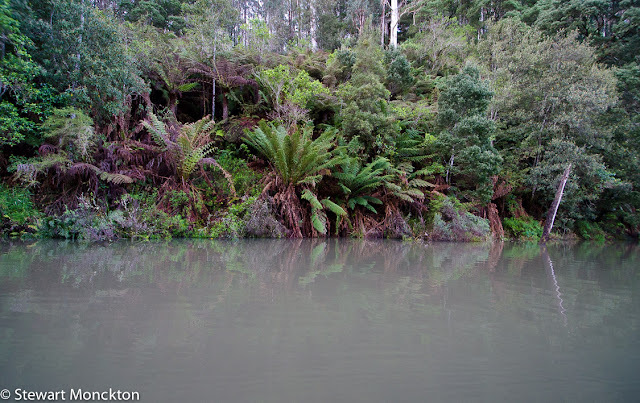 It was not a long walk to the lake, but it was a good one; past a small pool turned coffee cream by its feeder streams; under tree ferns that gave up their drips to the slightest touch; down muddy slopes and up gravel crunchy steps. Shadows darken under mossy banks, running with water, silver drop after silver drop. The trees’ shadows bring on evening on the forest floor, while sunshine keeps the trees’ tops in the afternoon. It’s an uncertain time. We wonder if we will find the platypus we have come to see. Before we arrive at the lake, we walk along a footpath that mirrors the stream’s path and flows down from the flooded valley. And there in the river is a platypus. It’s a perfect view. It’s the kind of view that predictably happens when your camera is still in the car, or in this case its bag. The back and front legs stick out from the rounded body, the bill flickers from side to side on the surface. It’s hard not to think that the platypus is shaking water from between its bill to dry out a mouthful of food. It dives a couple of times. The last dive slightly precedes the arrival of my camera. It never seems to come back to the surface. Clearly it must have, but we don’t see it. And this is where the transaction of money starts to work its way into the mental conversion. The tours web site had promised a 90% chance of seeing platypus – a delightfully high and (as far as I could tell) untestable number. Why not 91 or 89? Or was it meant just to mean, highly likely? Whatever the actual probability, the sighting had been achieved and now the promised 20% refund if no platypus were sighted was off the table. But what counts as a “sighting?” (The platypus in the river clearly does – but just go with me here). Did everyone in our group have to see one? Did the sighting have to be good enough so that the untrained eye could tell the difference between a claimed sighting or a floating log? None of these issues are in play if you have just gone for a walk to a lake, and you happen to see platypus – the presence of a financial transaction seems to place some assumption of quality on the experience. And does this assumption tend to sit between what you do see and what you hope to see, meaning the good needs to be great before it makes the grade? And if that really does happen, does it matter? 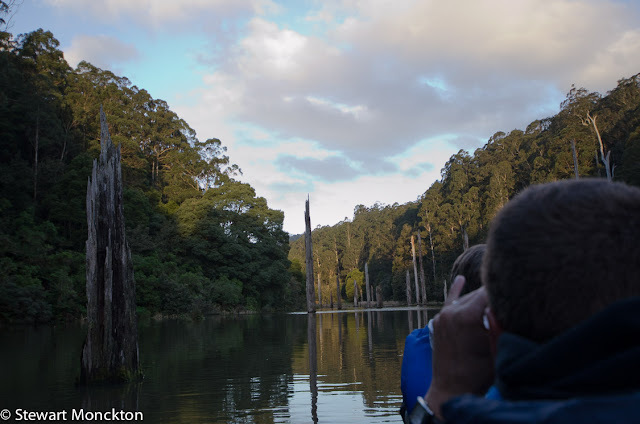 Is a half glimpse of a platypus on a tour any different to one at another time? Is a whale from a tour any less of a thing to see than a whale from shore, unexpected and unplanned? And why did these thoughts not come to mind when I was watching crocodiles from the safety of a tour boat in northern Australia? Down by the pale green grey water our guide ties the canoes together to form a raft. The perfect length of frayed blue rope falls into place around the thwarts and binds the pair of boats into a stable platform. We push off from the shore, away from the river where we saw the platypus and out along the edge of the lake. 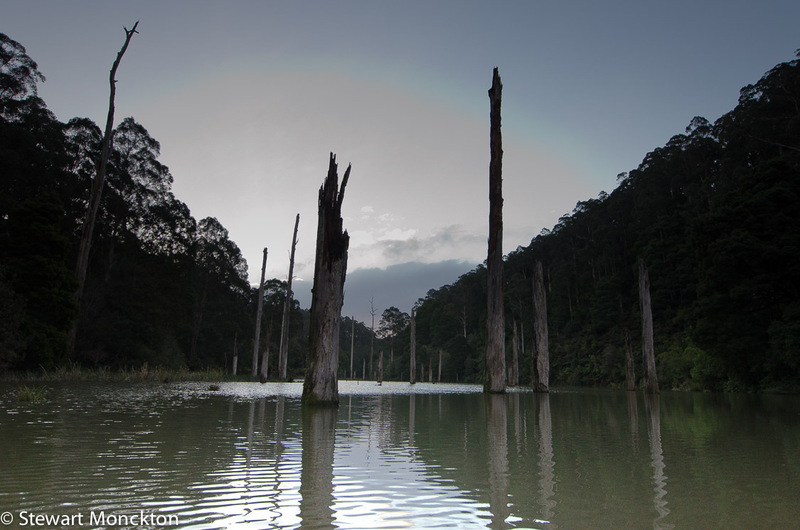 Tall trees sprout from the water’s surface, long dead and leafless. Bankside tree ferns dip their fronds in the storm brought high water. Clumps of rushes, marking shallow water, short spike up through the reflections of the trees that cloak the steep banks. Our canoe raft moves along the sharp point of a vee, a narrow lake of uncertain depth and certain history. If there is any wind higher up the slopes, it dies by the time it reaches the water’s surface. The spreading circles of paddle strokes trail behind the boat, some part rimmed with bubbles: the water looks thick and glassy. Despite the stillness the water crackles with sparkling light. It’s not rain – I check to make sure, it’s not the reaching feet of insects nor the fizz of lake bed bubbles. Few options remain. The Brownian collision of the air with the water? Interference from the passage of red blood cells through the capillaries on the surface of my retina? Who knows? But the water sparkles, the paddle bubbles pop and the platypus stay hidden. Pacific black ducks run over the surface, the string of rings left by webbed feet stopping abruptly as they take to the sky. They pull a tight turn around the tall trees and head for the other end of the lake. For a surprisingly long time the ripples look like diving, swimming or waving platypus. Desperate times call for desperate measures. We are reassured that the other side of the lake is a monotreme hot spot as we drift over the mirror water. I am feeling less than convinced. But I am wrong. 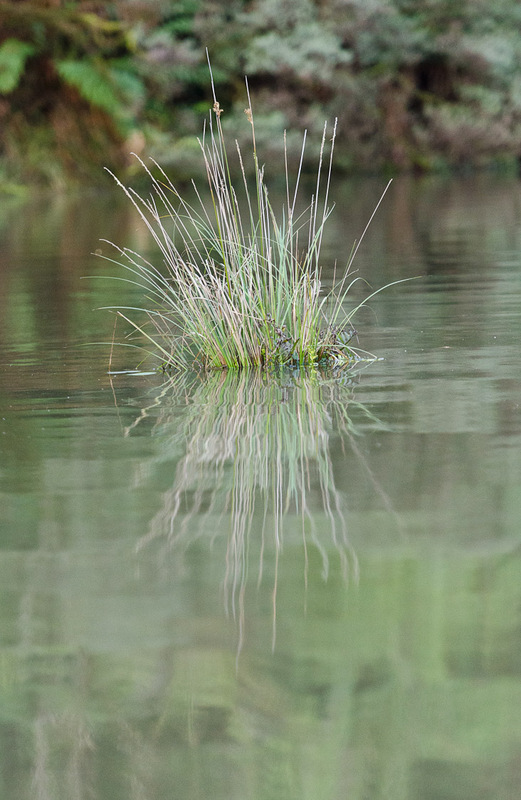 A platypus swims slowly away from the bank and dives. The ripples are easier to see than the animal. When it re-emerges from the water frantic clock based directions are given in loud hushed whispers – they work just in time for me to catch sight of another set of dive bubbles. P reminds us telling the time is not her strong suit yet; she has a point. The quested beast pops up on the other side of the boat and I get three pictures – one of which is totally out of focus, the second of which shows a slightly blurred (but very small) platypus and the third shows a perfectly in focus set of spreading ripples. We never see the platypus again. I’m not sure the kids saw this animal – they say they did, but at this age they would say that. Give it a few years and they won’t speak at all. We move slowly back towards the start: biscuits and warm hot chocolate help lift the spirits. H and P have been uncharacteristically quiet. They don’t know about money changing hands, all they know is that they did not get to paddle the canoes. The platypus may have been incidental. It really is dark by the time the ropes are undone and the boats flipped and pulled ashore. Bats flit over the water, the kids can hear them, but older age and rock concerts have robbed me of that experience. The guide takes out a pale torch and the kids move into the pool of light. Real darkness is rare and for the kids, very unusual. I hang back a little, knowing that in a while my eyes, which have not been dimmed in the same way as my hearing, will soon work in a way that is almost as rare as darkness. Given a little time, and possibly youthful practice, you can learn to (almost) see in the dark. Starlight, moonlight and evolution combine to transform an otherwise black landscape into one carved in shades of grey. The sky is not as dark as the land or the trees that finger towards it. You can see which way is up, and in many places you can see the shape of the land ahead. But woodland baffles the senses of the nightwalker. You need to move slowly. The path itself, stripped by passing feet of plants, seems to shine a faint silver, so that it becomes of sliver of light weaving its way through the trees. You can see edges and corners. Your brain builds shapes. You listen to the fall of your feet: do they crunch or squelch, do plants tickle and branches rub. You need to move slowly. But this walk as is easier than most. The sides of the path are lit up with thousands of tiny lights. Glowing specks that come out like the evening stars as your eyes adjust. Glow worms – tiny insects trying to lure others to their death – speckle the path side. Where it is darkest, when the shadows lie thickest, the little lights are most common. Darkness and dampness flare with a strange chemistry that marks the way. The tangled bank takes me home. Next morning, in bright sun but a chill wind, I cradle a coffee in my hands. In the river, the kids paddle a boat around in ever decreasing circles. They both offer frantic criticism of the other’s effort and technique. Both are close to tears of laughter. Down on the river edge mud, a Masked Lapwing, pushed to the outermost limit of its tolerance by the hilarity afloat, takes to the wing. 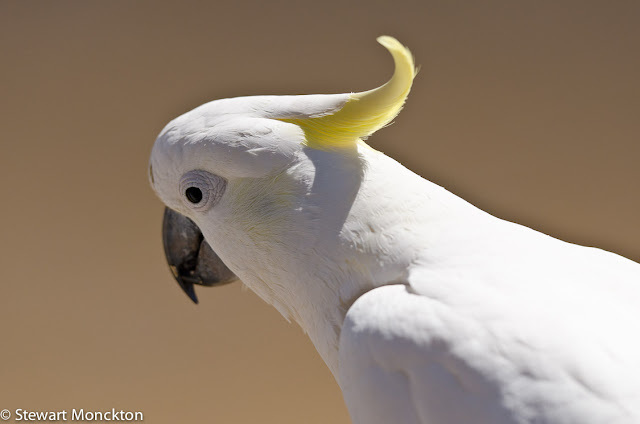 With a rushing flutter of wings a Sulphur Crested Cockatoo lands on the balcony fence, and studies the remains of my toast. Yesterday, I paid for a guide and found a platypus. Today, I paid for my breakfast and found a cockatoo. Why should one feel more real than the other? Why do I feel the need to rank order the quality of the sightings? 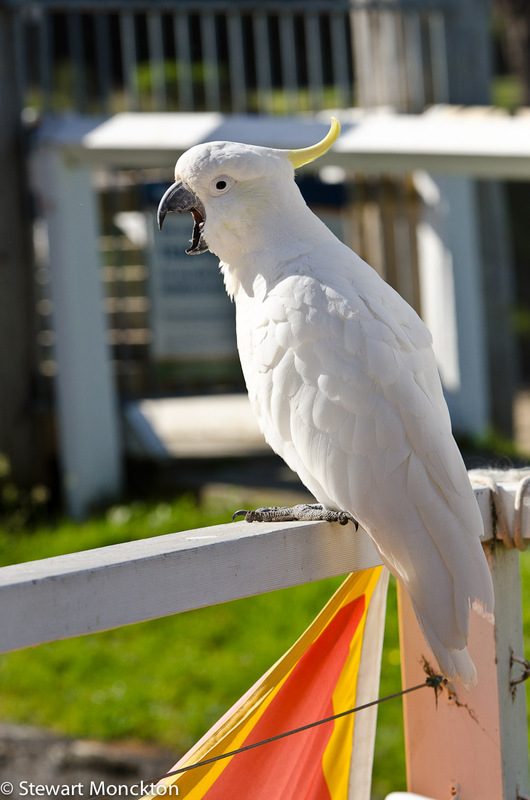 The cockatoo yawns. I think it knows the value of such thoughts. I raise my camera to shoot. The boat grinds into the mud below the café, and the cockatoo does not even look. I think it has seen it all before. I agree about the impact of the financial transaction - it changes the nature of things. It may even be as simple as "organisation" - if someone showed it to you it's not "your" platypus - the effect is akin to seeing one in a zoo. I saw an Osprey on Bassenthwaite the year before they set up the observatory. It was a distant view - sitting on a post _ but I was the only one who saw it. I've never been tempted to go to the observatory. Ditto - I saw a whale on the way across Table Bay to Robben Island -a fleeting glimpse, and although I will almost certainly go organised whale watching at some stage, I'm sure this glimpse is the one I will remember. When the animal is wild, I think its better than a zoo view - but its on the same spectrum. The best whales we have ever seen have come as a surprise. Paying to get a sighting doesn't cut it with me either, except perhaps with dangerous carnivores in Africa which is only possible in my dreams anyway. Great photos and perfect lighting on the cocky. Thanks for taking us along on another excellent adventure. I enjoy your writing. I think there is nothing like the thrill of discovering something for yourself. A bear in the zoo is not nearly as exciting as one at your bird feeder or on the middle of the trail you are about to walk down. 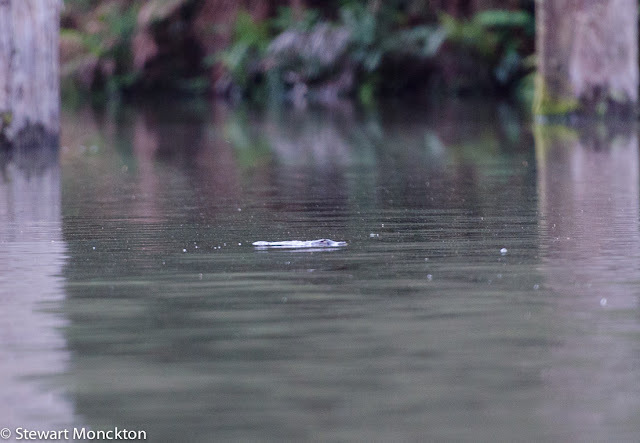 I've never seen a platypus swimming, even in a photo. So interesting. An excellent narrative. It's a pleasure to read your stuff. I enlarged your photos – they are excellent. What beautiful surroundings and if you discover anything – then it is even better. Your birds there are so colorful. We have birds in our backyard, but nothing like your fancy ones – we have cardinals, doves, black hat chickadees, etc. Excellent shots Srewart!! !How lucky you are to see a platypus !!!! !Wish you Merry Christmas to you and your family! Great bird shots! And I'd be excited to see a platypus too. I somehow got it into my head that the platypus was extinct! We have beavers nearby that I have never seen and we once saw manatee through the water but couldn't get a photograph of them. Also.....evening walks in wooded hillside behind Kennett to observe glow worm displays.......happy days! Thanks for the memory jolt..